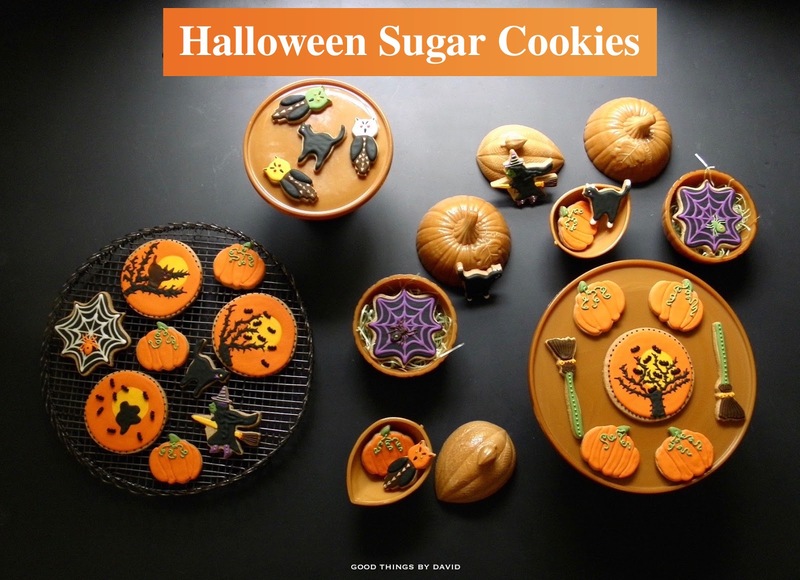 This year's Halloween sugar cookies were inspired by a set of cookie cutters that I recently purchased, which came in a very festive box. 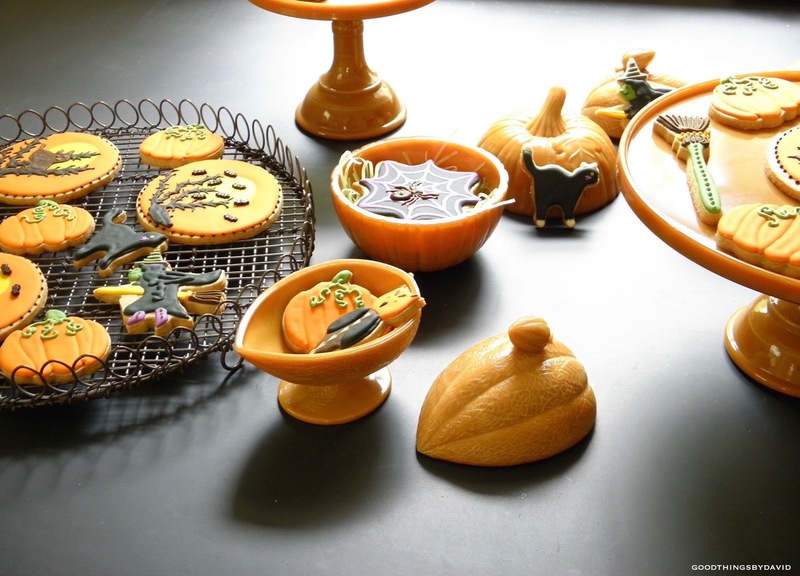 The small set includes an adorable Halloween cat, a witch, broom, bat, an owl and a small pumpkin. 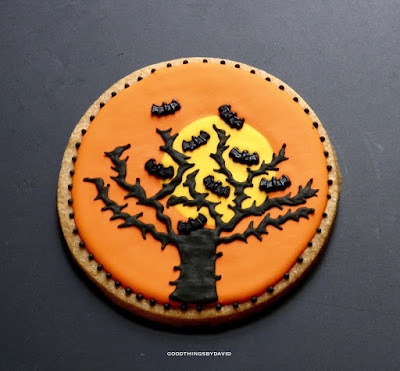 To enhance these festive shapes I added a few spooky night silhouettes made from simple round-shaped cookies. 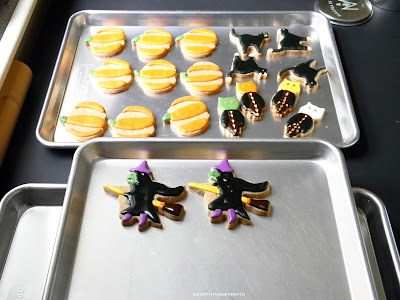 As soon as the cookies were baked and cooled, I tinted several bags of royal icing, and used a few tools and candies to embellish these ghoulish treats. 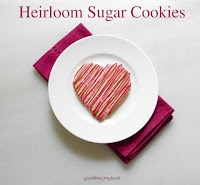 It's always a challenge coming up with new sugar cookie designs for my niece and nephews no matter the occasion or season. Since I don't like repeating myself, I'm constantly searching images, artwork and colors for inspiration. I'm pleased with the results and I think my little ones will be too. 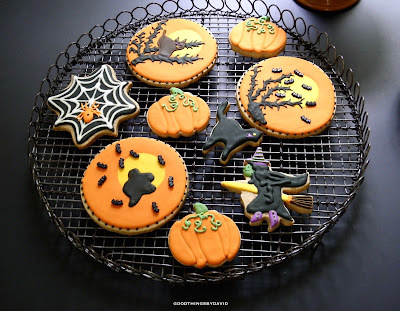 If you happen to make some iced sugar cookies for your Halloween party, make it a point to have a few pumpkins, cats, witches and spiders. Kids of all ages love a good treat! Let me show you how I iced this year's Halloween sugar cookies. 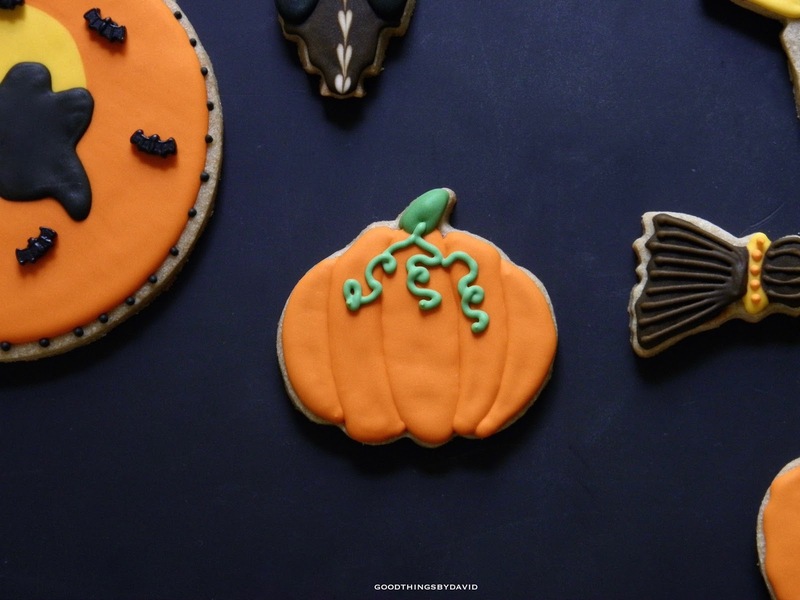 The pumpkin-shaped sugar cookies were iced in sections in order to give them some depth. 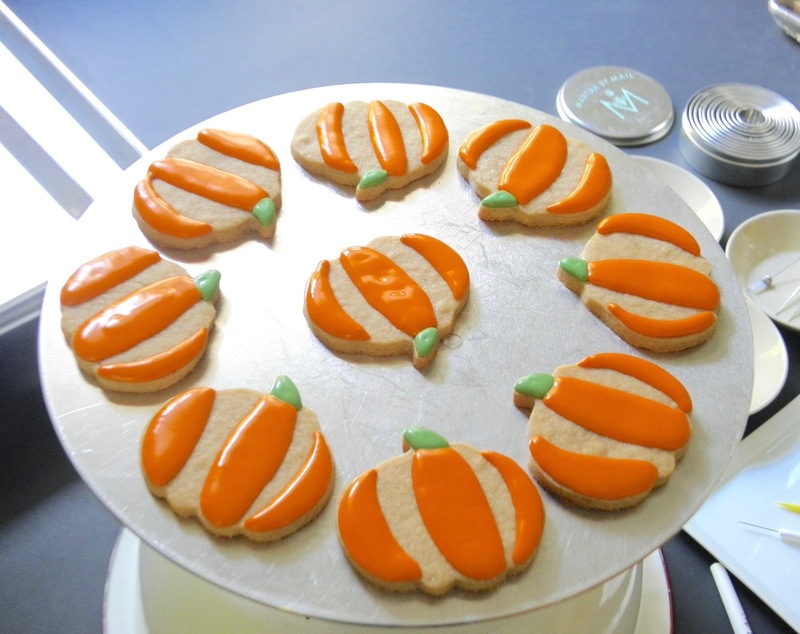 As you can see, each alternating section was outlined and flooded in a deep orange royal icing. The stem was iced using Americolor's 'avocado'. These were then left to dry and set before continuing. The mini owls were so adorable and so easy to make. Each head was outlined and flooded in a particular color and pearl candy eyes were placed while the icing was still wet. The body was filled a dark brown color and the wings were pure black. White dots were added down the body while the icing was wet, and I ran a decorator's pick through them to create bleeding hearts. These were then left to dry completely. 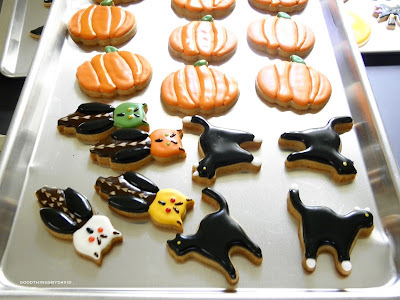 Kitty cats were given a simple treatment of black royal icing with yellow eyes. A couple of the cats were enhanced with white paws and white-tipped tails. Done! 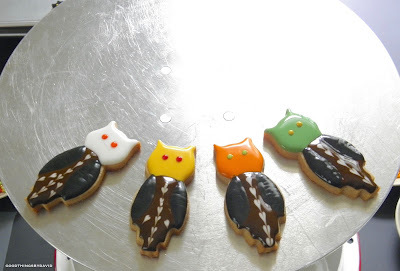 After the icing on the owl faces dried, I added two small dots of royal icing above the eyes, one on each ear, and one just below the eyes. Using that handy decorator's tool, I dragged the icing down to make "eyebrows", ears, and a small beak. The owls were then left to dry completely. 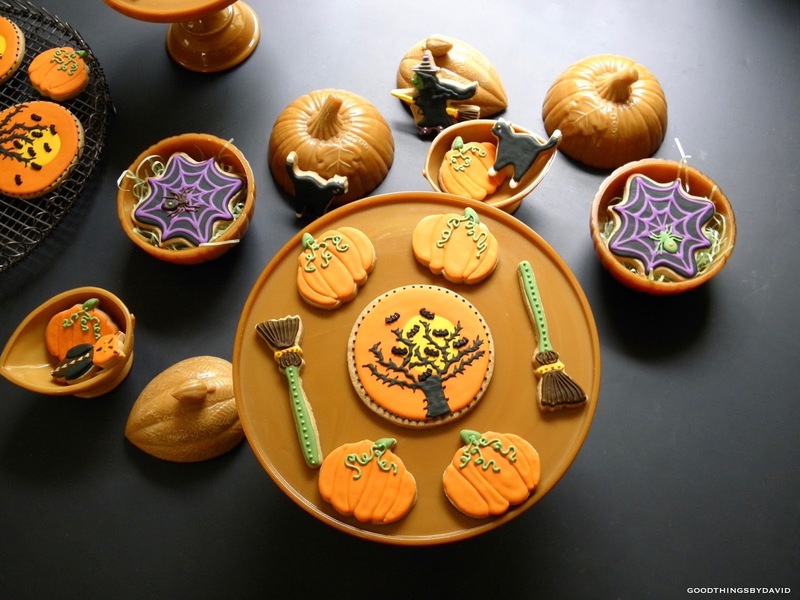 The remaining sections of the pumpkin-shaped cookies were filled with the same royal icing. These were then left to dry completely. Small vines in the same color as the stems were then piped on all of the pumpkins using a #1 piping tip. 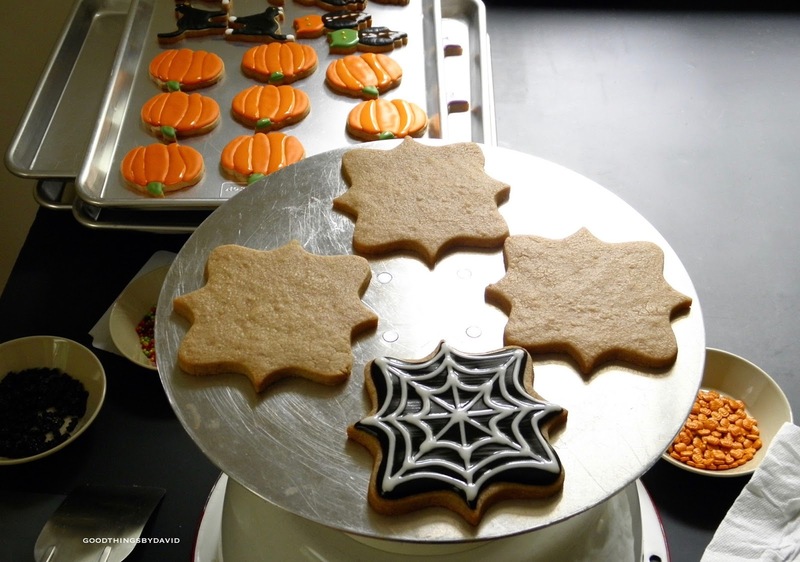 Spiderweb cookies were made using a monogram plaque cookie cutter shape. I like how the shape lends itself to a spiderweb design. Outline and flood the base of the entire cookie in black royal icing. Using a different color, create spokes from each point of the cookie shape. You can then pipe swags of icing to make spun webs! Let the bases dry completely before piping spiders. 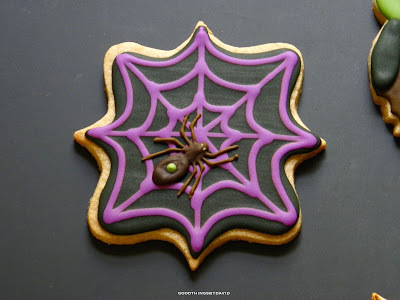 For the spiders use a different color of royal icing. Pipe a large dot of icing for the spinneret end of the spider and attach a smaller dot for the abdomen area. Pipe four small legs on each side of the abdomen as shown, and then pipe two dots for eyes and one dot on the spinneret. Let the spider dry completely. Witches don't have to be scary or gruesome in order to make them high-spirited. Make charming witches by giving them a flowing cape, matching boots & hat, and an endearing smile on her green-hued face. 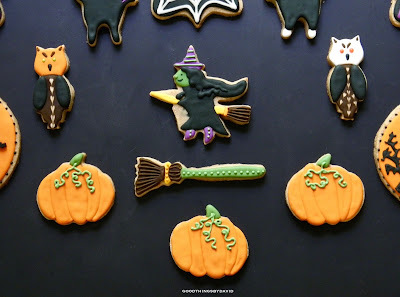 Yes, even witches can have a good time during Halloween. Don't forget to pipe a broom! 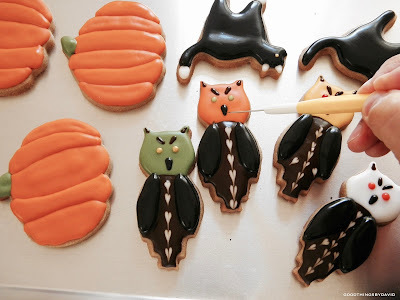 Don't the witches, pumpkins and owls look cute? Now it's time for that broom. The broom is very simple. Pipe a green handle down to the area that meets the broom corn. Pipe the bulbous broom corn area in dark brown royal icing and then pipe the metal band area in a light yellow color. The remaining bristles should first be flooded in brown royal icing. Let the entire cookie dry. Pipe dots along the handle and the metal band area, and pipe brown bristles using a fine, #1 piping tip as shown. Done! For the nighttime silhouettes, use large rounds as bases. 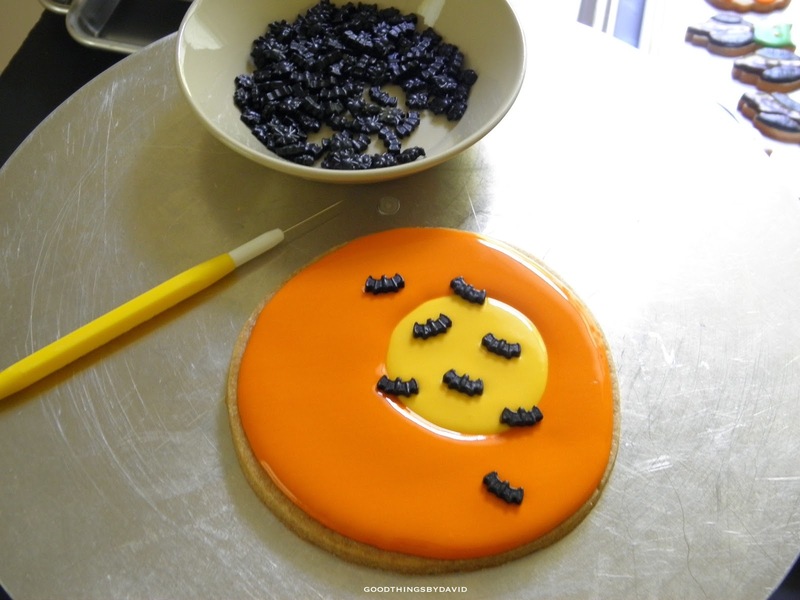 Pipe a deep yellow circle off-center, and then immediately outline and flood the entire cookie using a dark orange royal icing. 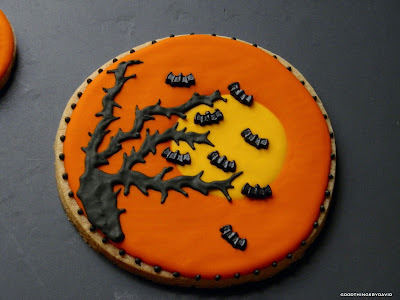 While the icing is wet, carefully place bat candies around the "sky". Let this dry completely. To make the spooky trees, use thick black royal icing to pipe a trunk and several branches throughout the cookie. 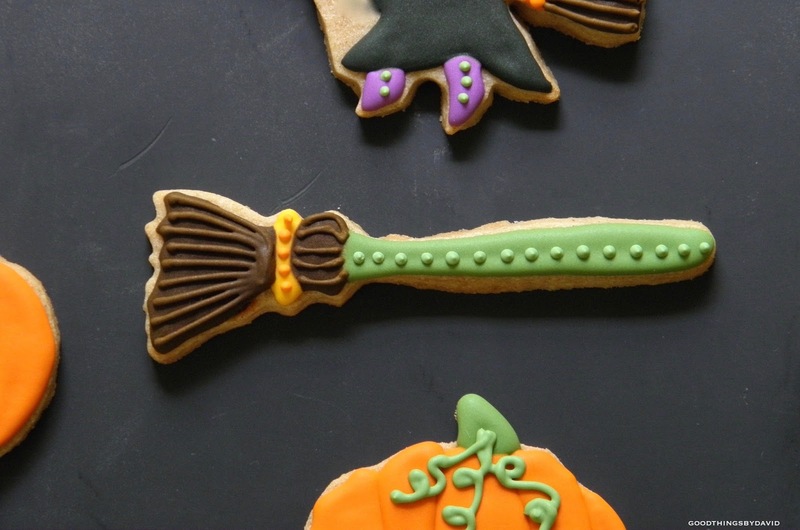 Using a decorator's pick or a toothpick, drag out icing to create thorny branches that defy all explanation. This is the fun part because each branch will be unique. Give your bats plenty of space to fly around! If you leave the black royal icing on the thicker side, you will be able to create texture with it when you drag it out. This will give the trees a more realistic look to them. 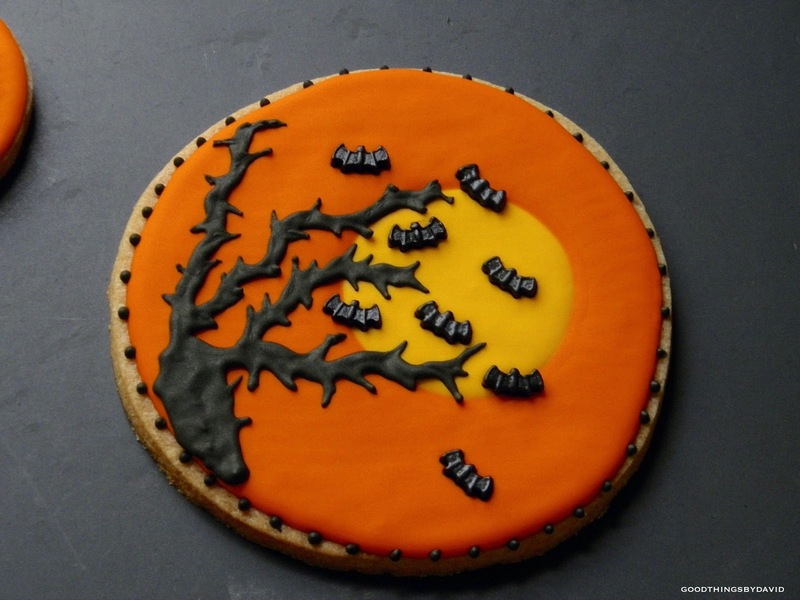 Some nighttime silhouette cookies shown on this Martha by Mail wirework rack, were given flying ghosts, while others were assigned a kitty cat perched high up on one of the branches. I think the kids are going to like these a lot! 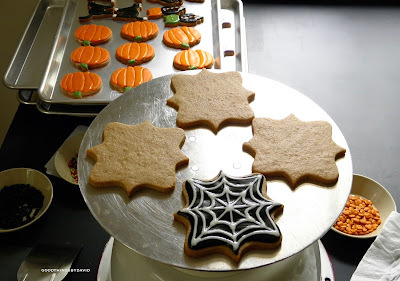 Make your Halloween cookies a part of the treats buffet at this year's Halloween party. 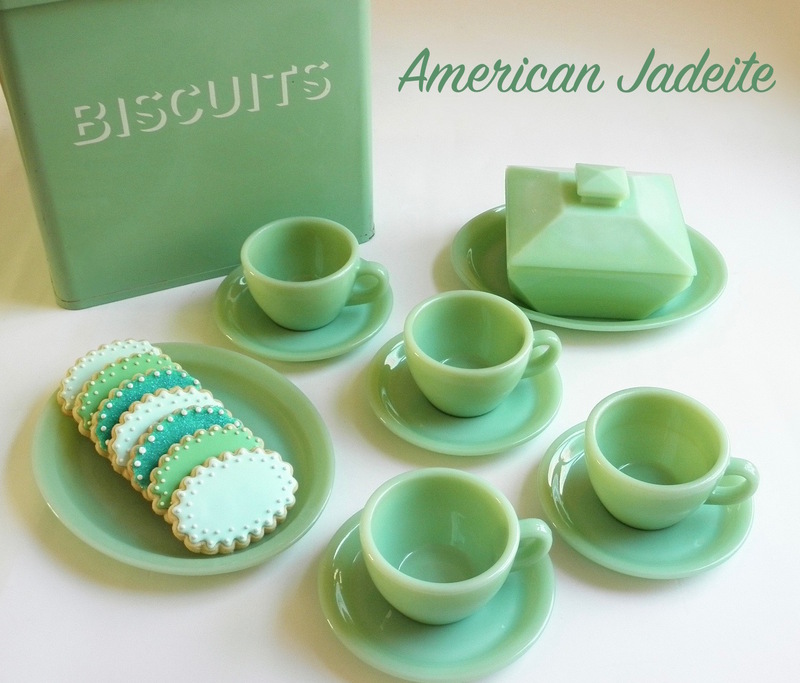 If you want to get creative, perch a few cookies in and around some covered dishes (these are Martha by Mail caramel glass made by L.E. Smith Glass), and let your guests find them. 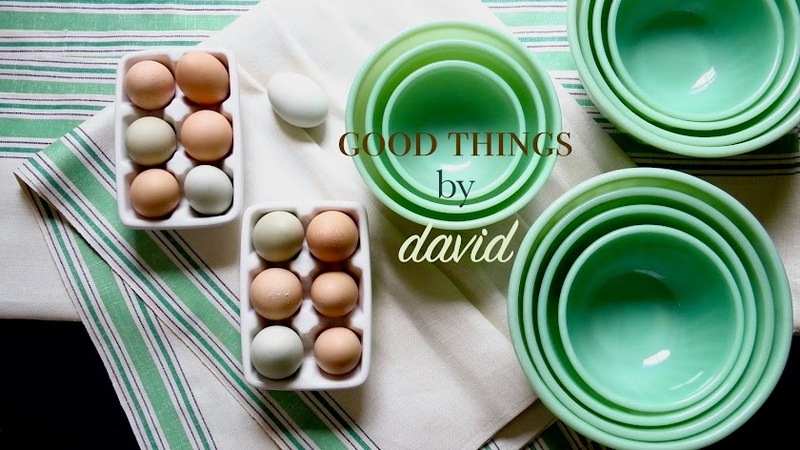 Cake stands always look great with several cookies, but so do old-fashioned wire cooling racks. It's up to you how you want to arrange them, so make the cookies enticing and make them colorful. I have a feeling that the Halloween cookies are going to be a big hit this year! One more thing: I did keep a pumpkin and broomstick cookie for myself, so don't let the cat out of the bag! Shhhh. Who could possibly resist?